Posted on January 12, 2016 by Barry V.
I dismantled my exhibition at Joppa Flats this morning, and afterwards decided to head south across Cape Ann to visit Kettle Island – one of Mass Audubon’s newer properties. Kettle Island is a small, uninhabited island just offshore of the attractive and poetically named town of Manchester-by-the-Sea. The island can be approached by boat, but there are no trails, and you cannot land on the island. However, the adjacent shoreline is owned by the Trustees of Reservations, and offers close looks at the island from the mainland. I knew there would be none of the breeding bird specialties of Kettle Island present at this time of year, but I wanted to see the island anyway. In summer its breeding colony includes two species of egrets, little blue herons, black-crowned night herons, glossy ibis and sometimes even tri-colored herons. 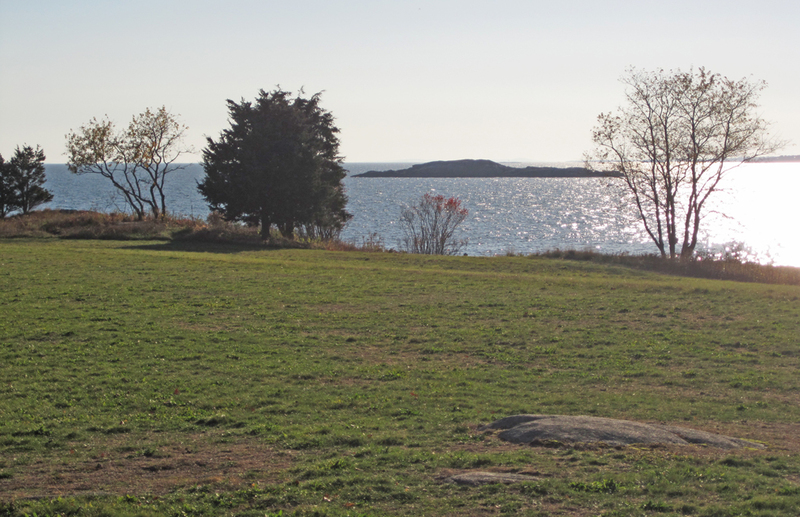 From the Ocean Lawn of the Coolidge Reservation, Kettle Island is the most conspicuous feature offshore. With my scope I can pan across the expanse of the island, observing the gulls, cormorants and ducks on and around it. I walk across the broad expanse of the lawn, observing and photographing the island from several vantages, and I’m about to start a drawing of the island, when a flurry of birds erupts from the ground between myself and the ocean. 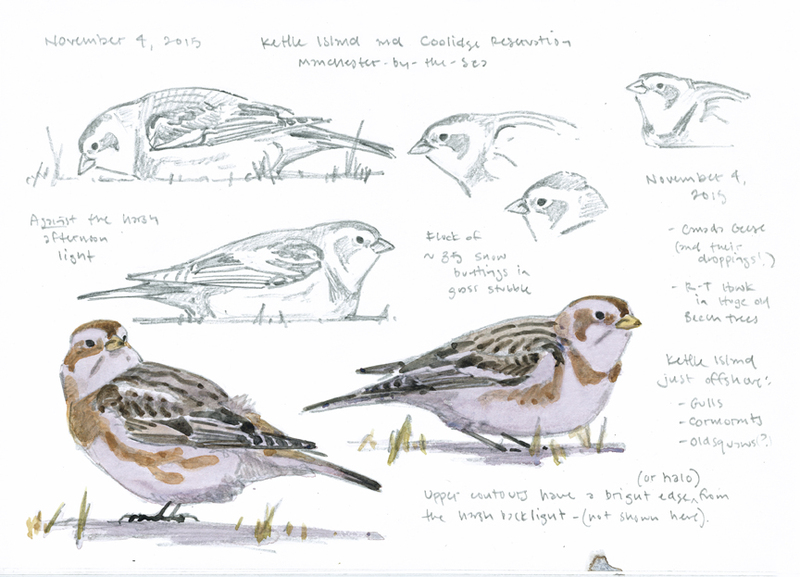 The little blizzard swirls and resettles even closer to me – a flock of about thirty-five snow buntings! From my position, I’m looking west and into the glare of the afternoon sun, which is already low in the sky at mid-afternoon. 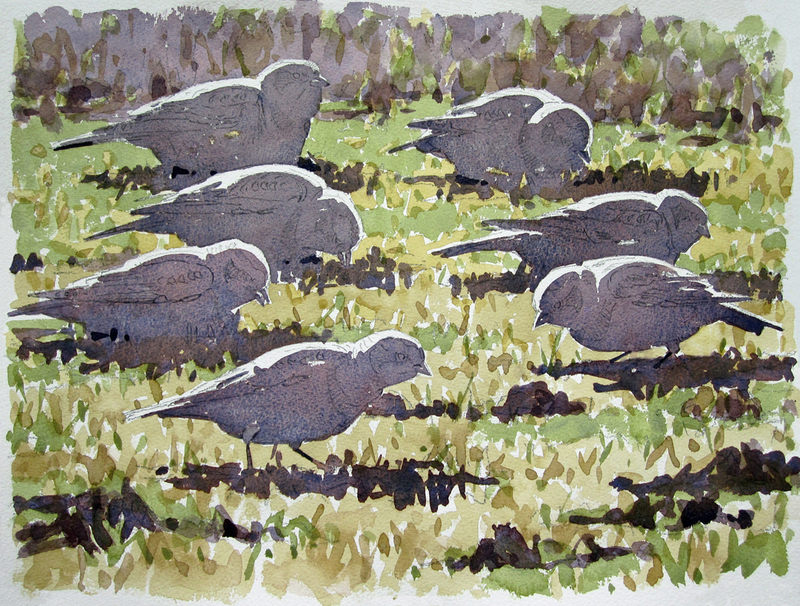 The birds are strongly back-lit, making bold silhouettes and outlining their upper edges with glowing halos. In sketching the birds with the scope, I pretty much ignore this effect, being more intent on capturing the shapes and gestures. But later, I realized that this aspect could be the basis for an interesting painting. 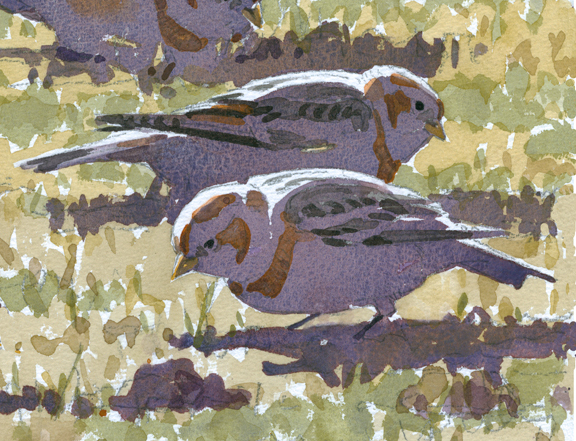 I’ve painted snow buntings before, but never in this kind of light. Nothing like a good challenge to get the juices flowing! Back in the studio I re-work my sketches and organize them into a pleasing composition. In laying out the group of birds, I realize I can overlap or “stack” them one in front of the other and by so doing I can make the most of those glowing halos. I do some very simple color and tone experiments to help plan my painting strategy, and then start on a larger sheet of watercolor paper. First, I paint the shadow pattern in a neutral mid-tone with a strong violet cast. These first washes on the bright white paper appear much darker than they will in the finished painting, so I anguish: are they dark enough? Or, have I over-compensated and made them too dark? These are the kinds of things that keep water-colorists awake at night! The next washes establish the background tone. It needs to be light enough so that the bird’s silhouettes really stand out. I also try to leave many little bits of white paper showing, to the give the grasses some sparkle, as they, too, pick up glare from the sun. 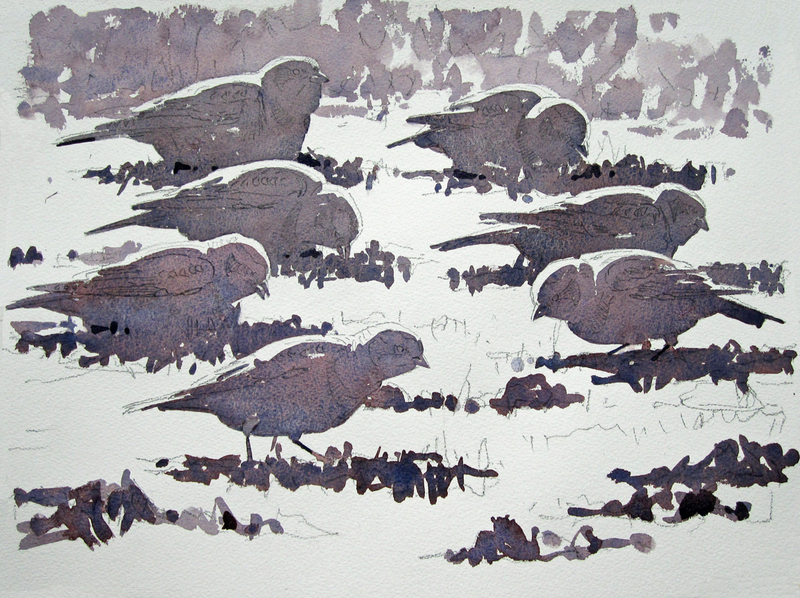 With the background tone in place, the shadow shapes of the birds look much paler – in fact, it’s possible now to imagine them as predominantly WHITE birds (which snow buntings are!). The final phase of the painting is pretty straight-forward. I simply add the local colors of the bird’s plumage (breast bands, wing-stripes, etc) right on top of the shadow silhouettes. 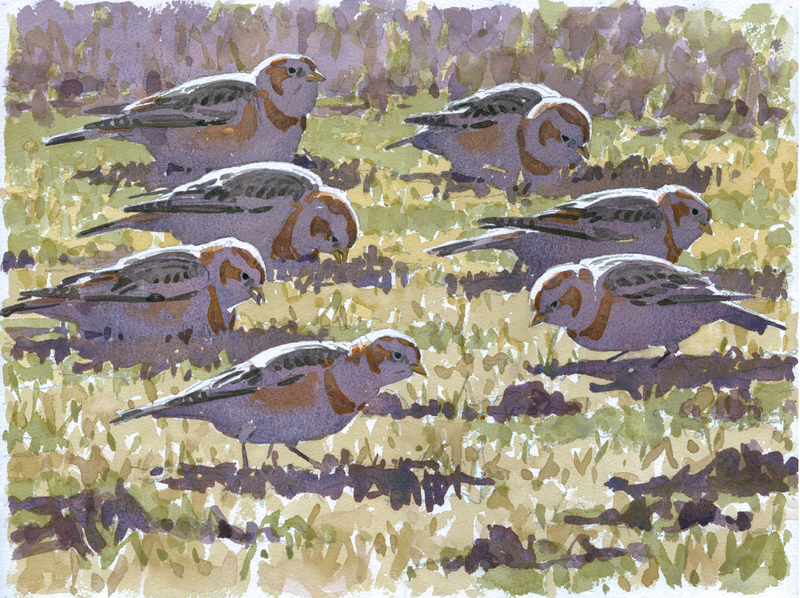 This entry was posted in Artists, Barry Van Dusen Residency, News and tagged Cape Ann, Coolidge Reservation, Craft, Island, joppa flats, Joppa Flats Wildlife Sanctuary, Kettle Island, Kettle Island Wildlife Sanctuary, Manchester-by-the-Sean, Snow buntings, Stages of painting, Watercolor, Wildlife Sanctuary on January 12, 2016 by Barry V..